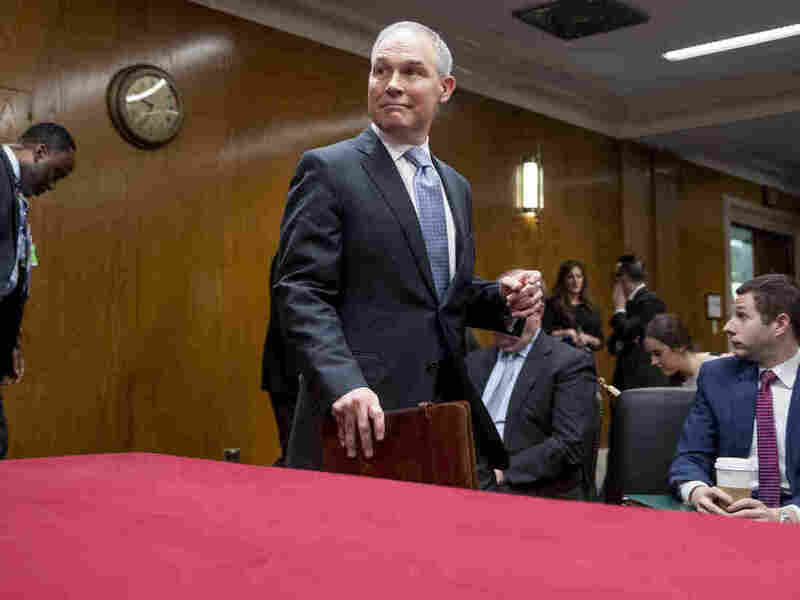 EPA's Scott Pruitt, Subject Of Many Ethics Probes, Plays Defense Before Senate : The Two-Way Pruitt is facing a slew of allegations of excess spending and, as of this week, claims his agency sought to block a study on a suspected carcinogen. "I share your concerns," he told senators. Scott Pruitt, administrator of the Environmental Protection Agency, arrives for his testimony Wednesday before a Senate Appropriations subcommittee. If Scott Pruitt arrived on Capitol Hill expecting to be grilled Wednesday, he did not have to wait long to see that expectation fulfilled. The Environmental Protection Agency administrator, who is facing a series of federal ethics investigations some 15 months into his tenure, fielded reproaches from both sides of the aisle during testimony before a Senate Appropriations subcommittee. "I'm being asked — really, constantly asked — to comment on security, on housing and on travel, instead of seeing articles about your efforts to return the agency to its core mission. I'm reading about your interactions with representatives of the industries that you regulate," said Alaska Sen. Lisa Murkowski, GOP chairwoman of the Interior, Environment, and Related Agencies subcommittee. Late last month, Pruitt appeared before House lawmakers and confronted questions surrounding — among other things — a controversial housing arrangement, in which he lived in the apartment of an energy lobbyist's wife for $50 a night, and travel expenses that included first-class flights and an around-the-clock security detail. During that testimony, GOP lawmakers largely defended the EPA chief, but Wednesday's hearing about the agency's budget saw some criticism from Murkowski, even if phrased gently. "Now some of this undoubtedly is a result of the 'gotcha' age that we that we live in today that dominates the politics of today," she added. "But I do think that there are legitimate questions that need to be answered." The day before his Senate testimony, the list of those questions became just a little bit longer: Politico reported that emails revealed an attempt by the EPA and the Trump administration to delay a federal study on a suspected carcinogen, fearing what one White House aide reportedly described as a "potential public relations nightmare." As NPR's Hansi Lo Wang noted more than two years ago, the chemical in question — perfluorooctanoic acid, or PFOA for short — "has contaminated water supplies in New York, New Hampshire and Vermont." PFOA, which is often used to make nonstick materials for cooking pans and carpet, has suspected links to certain forms of cancer and has been found to interfere with children's vaccines. "This is not just a local problem," Philippe Grandjean, professor at Harvard's School of Public Health, told Hansi. "This is a problem which I am sure occurs in every single state." "You have to fly first class — oh, come on!" Leahy told Pruitt. "To use your public office for private gain is ego run amok." The subcommittee's ranking Democratic member, Sen. Tom Udall of New Mexico, pressed Pruitt the hardest — including on big pay raises to staff and the $43,000 soundproof phone booth installed in his office, which the Government Accountability Office said violated federal rules. Pruitt did not directly address the Politico report, but he defended himself against the spending allegations, asserting that any potential issues were the fault of inadequate regulations, rather than wrongdoing on his part. "There have been decisions over the last 16 or so months that, as I look back on those decisions, I would not make the same decisions again," he said. "But some of the areas of criticism are frankly areas where processes at the agency were not properly instituted to prevent certain abuses from happening." Pruitt noted that the move to install the phone booth demonstrated that. "There were not proper controls to ensure a legal review of the obligation of the agency to inform Congress and GAO," he added. "And I started a process shortly after I found out about it that we investigate that and institute those controls to ensure that that does not happen again." And he declared that he intended in the future to improve matters — which, for the most part, he argued, were not his fault. "I share your concerns about some of these decisions. I want to rectify those going forward," he said. "I also want to highlight for you that some of the criticism is unfounded and, I think, exaggerated. And I think it feeds this division that we've seen around very important issues affecting the environment."